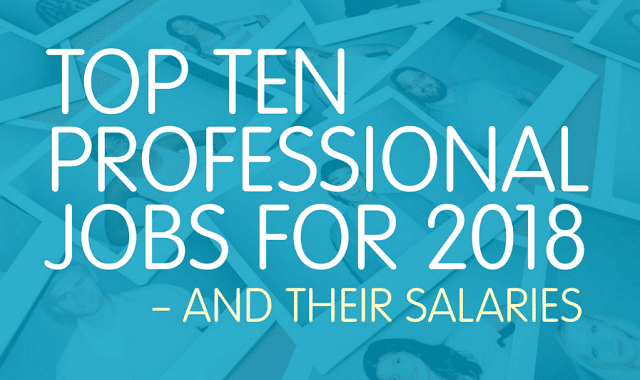 Top 10 Professional Jobs for 2018 and their Salaries #Infographic ~ Visualistan '+g+"
The economy is moving close to full steam ahead. Companies are investing, unemployment is relatively low—5% overall and usually 1-2% lower for those in professional services—and job candidates can be selective with job offers. Across HR, non-clinical healthcare, supply chain and logistics, and office administration, there are 10 jobs that are in ultra high demand, and based on our staffing data, are projected to pave the way into 2018. Yes, they're that popular. So, what positions are they? What are the updated job descriptions for the professionals who occupy these spots? And what are their salaries? Take a look at this infographic for the answers.